Chemistry Professor William Dolbier is trying to improve the activity and longevity of medicines entering and staying in the body. As a specialist in physical organic and synthetic organofluorine chemistry, his specific studies include the way fluorine molecules affect reactivity of organic compounds. “With more than 50 percent of present-day prescription drugs and agrochemicals containing fluorine, we work to develop building blocks to facilitate specific incorporation of fluorine into compounds,” Dolbier says. His current research interests relate to studies of the reactivity of compounds containing fluorine, in particular free radical, carbene and pericyclic reactions of organofluorine compounds. Much of his recent research has been devoted to the development of new synthetic building-block strategies in organofluorine chemistry, including difluorocarbene, nucleophilic trifluoromethylation and SF5 chemistry. “We’ve already developed one diagnostic drug that’s used in a PET scanning procedure. It allows doctors to detect oxygen-depleted tissue in the body, and thereby pinpoint the location of tumors or strokes,” he says. Dolbier is also working on a number of other potential commercializable technologies directed at the pharmaceutical and agrochemical industries. Dolbier has been at UF since 1966 and teaches introductory organic chemistry at the undergraduate level and advanced mechanistic organic chemistry at the graduate level. He has more than 225 refereed publications and his research is funded by the National Science Foundation, the National Institutes of Health, the United States Air Force and various companies. 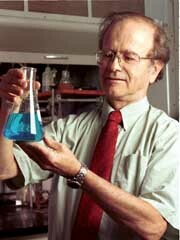 In 2000, he received the American Chemical Society Award for Creative Work in Fluorine Chemistry.